In 2012, The Fragrance Foundation received only 2 or 3 entries in the "Indie" Category for a Fifi Award, yet in 2013, that number soared to 36, and in 2014 there may be even more. What is an Indie Fragrance, you ask? And how does it differ from Niche and Artisanal? Fifi recognizes an Indie fragrance as "a brand not distributed or owned by a large company and sold in under 50 stores." The majority of brands you find listed are probably ones you’ve never heard of, yet from this hotbed of fragrance creativity many interesting, up and coming fragrances can tiptoe into the market. Both Male and Female consumers are harkening back to the era of true fragrance creation where artisans crafted fine fragrances for individual clients, others discovered them, appreciated their uniqueness and smaller Scent Shops or Scent Bars introduced them to an eager public. Come and hear about Artisanal, Niche and Indie fragrances from two West Coast pioneers and learn about the challenges they faced in growing their brands, where they see emerging trends and why this category is growing in popularity. 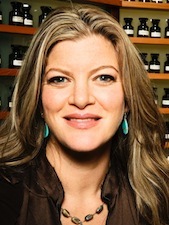 As a freshman at Emerson College in the late 80’s, Sarah began her career in fragrance when she stumbled upon an off-beat apothecary-perfumery called Essence on Newberry Street in Boston They specialized in creating custom essences for clients. Fueled by her intuitive knack for perfumery and the belief that fragrance is a vehicle for self-expression, Sarah began working one-on-one with clients there to design their perfect custom scent, a process she called The Fragrance Journey™. This became the heart and soul of her business. After four years apprenticing at Essence, she purchased the store and continued to fine-tune her craft, while building a reputation as an accomplished nose. In 1994, she sold the business, packed up her oils and moved to Los Angeles where she founded Creative Scentualization, which gave birth to Sarah Horowitz Parfums. Sarah spent several years toting her fragrances around the beaches of Malibu doing Fragrance Journeys and designing custom fragrances for clients, and soon built a steady following. In 1997, Perfect Perfumes debuted at Malibu's Planet Blue with Perfect Gardenia -- a nature-identical tribute to the flower and twelve other Perfect scents soon followed. In 2000, Nordstrom launched the Perfumers Palette, 33 single note scents that could be worn alone or layered together. This wardrobing approach to fragrance was quickly adopted by other brands, igniting a trend. In 2006, Sarah created a collection that includes five fragrances for Barneys New York called What Comes from Within: Light, Love, Peace, Joy and Beauty Comes From Within, all embodying Sarah's personal philosophy of life. Her intuitive approach defines her uniqueness in developing fragrances that are truly one-of-a-kind. “Finding your perfect fragrance brings you into the moment and reminds you who you are and what you love,” says Sarah, and she continues to evolve her craft and grow her business while striking the delicate balance between her career and her role as mother to Jessica and Gianna, and wife to artist husband, Greg Thran. 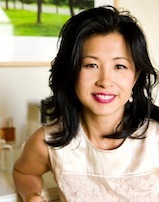 In 1994, Yosh Han walked into a fragrance boutique in Aspen and knew she was where she belonged. Wishing to work there, she insisted it was her destiny, and the owner agreed with her saying "If she thinks she's supposed to be here, let's see what she’s supposed to do.” Thus began Yosh Han’s career as a perfumer. Following her two year fragrance apprenticeship, she learned to identify various sensuous perfume essences and, and after moving to San Francisco, used these unique elixirs in her practice of perfumery to create her own line of artisanal scents. Yosh created a custom collection of unique, multifaceted scents hand-crafted with the finest fragrance ingredients available, then assigned numerical values corresponding to both the fragrance family (floral, fruity, green, etc.) and the specifics that resonated with her client’s numerology and Chakra energy centers. These distinctive, original scents not only set one’s moods, they capture one’s fancy. Yosh now consults on olfactory trends and the culture of perfume, and her eponymous collection has grown substantially. It is now available at Barney’s New York, Saks Fifth Avenue Dubai, LuckyScent and Scent Bar in West Hollywood, to name a few. She has been featured in the NY Times, Vanity Fair, Allure, WWD, Glamour and Elle. And that destiny thing? The Chinese character for Yosh means fragrant. This woman seems to have found her true calling. Bellus Academy is recognized for Excellence in Education by the publishers of Modern Salon magazine. The Academy has lead the development of 15 advanced courses that prepare students to immediately enter the Luxury and MediSpa Industry with technical and business acumen. Bellus is proud to be the founding member of the California Coalition for Advanced Skin Care Education. The Coalition has sponsored a legislative bill in Sacramento, AB 1153 that will create a Master Esthetic License and a 1200 hour curriculum that schools across the state will be able to offer. As we all know, the Skin Care field has changed significantly over the years while the laws regulating it have not kept up with the technology and methodologies commonly utilized by skin care professionals. Join us for a web presentation on the new law and the proposed Grandfather language that you NEED to know to support your esthetic business! The Packaging Company ( TPC ) is a leading manufacturer in Cosmetic containers and Cosmetic packaging. We offer a full line of health and beauty aids packaging, spa products packaging, pharmaceutical & nutraceutical packaging, anti-aging & skin care products packaging, hair care & styling products packaging. Dessert – Raspberry Sorbet topped with Fresh Raspberries and Mint Leaf and served with Freshly Brewed Coffee, Tea & Iced Tea.